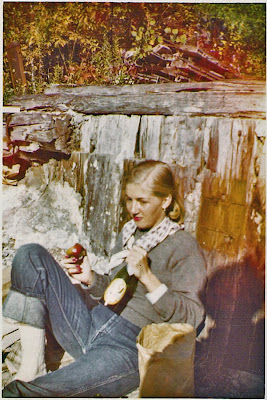 My mother, in 1956. Her lipstick matches her apple. She looks so of her time. I see the resemblance between your mother andyour daughter, too. oh i love that. really, really love it. oh, wow, what a classically beautiful photo. Oh that's just awesome! I might have to go find me some lipstick. Holy. Your Mom was stylin'. She's gorgeous! You look so much like her! I LOVE red lipstick, but am not sure I can get away with it anymore. Your mother did. Could this photo be any more awesome? Er, nope. Wow, that's a gorgeous photo! That is just stunning. I can see your daughter in her. I love this, too. She clearly had style. I like it that you can see the shadow of the photographer. Who would that have been? Mary Kearns Burgess, also Class of '57 at Smith. Oh, fab. Yes, love the details and the shadow! Lipstick and fingernails -- classic and classy! What an amazing photograph -- thank you for sharing! Really, nail polish on her fingers? Now polish on her toes maybe, I do believe she did that! Mir's fashion sense is inherited, I see. And what's is that bottle? Whatever it is, seems she has it all to herself. What a day that must have been. Why are older pictures so much better than todays? What a wonderful picture! You're so lucky you could be her when you grow up.